TWO HOSES IN ONE !! 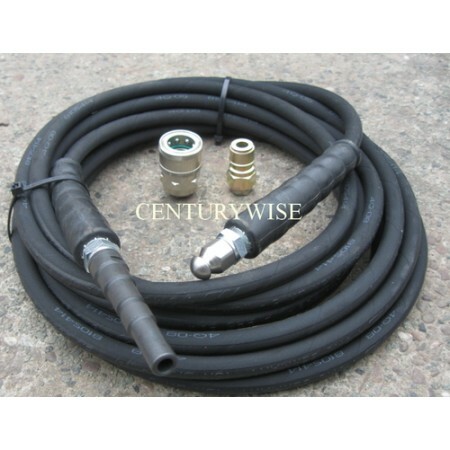 THIS IS PROFESSIONAL QUALITY JETTING HOSE, COMPLETE WITH ALL FITTINGS TO USE AS AN EXTENSION, OR DRAIN CLEANING HOSE. 10 MTRS. OF HIGH PRESSURE HOSE WITH DRAIN CLEANING NOZZLE , MALE SPIGOT TO FIT TRIGGER OUTLET, AND MALE/FEMALE QUICK RELEASE COUPLINGS. MULTI-TASK HOSE.. . YOU ARE UNLIKELY TO HAVE TO CLEAN YOUR DRAINS VERY OFTEN , SO THE DRAIN CLEANING NOZZLE AND MALE SPIGOT CAN EASILY BE REPLACED WITH THE QUICK RELEASE COUPLINGS (SUPPLIED) TO GIVE YOU A VERY USEFUL EXTENSION HOSE.